Attractive Concrete Picnic Tables: A Long Lasting, Sustainable Solution! People searching for solid values in picnic tables should pay close attention to the advantages offered by durable concrete products. Over the long term, an investment in this type of outdoor amenity offers significant benefits. This brief article addresses some key reasons to select a stylish concrete picnic table. Concrete appeals to landscapers because this long lasting material will adhere to a dazzling variety of shapes and configurations. 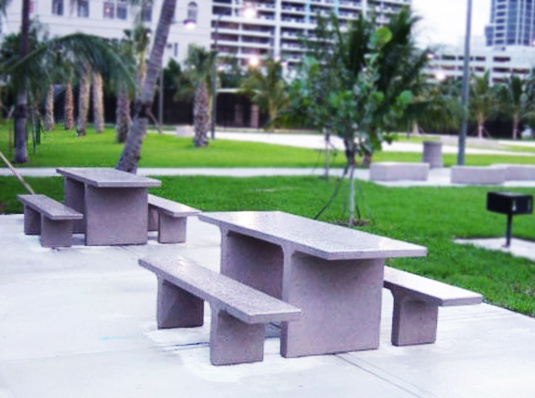 Today, concrete picnic tables occur in a multitude of dimensions: square, rectangular, circular, or curved. Once installed, a concrete table requires comparatively little maintenance. Ease of Installation: Concrete products permit seamless installation on firm concrete or stone foundations. Owners may even use concrete to securely mount the table and benches. (We recommend mounting concrete products for safety reasons.) Once affixed correctly to the site, the table becomes a permanent fixture, contributing to the value of the real estate. Attractive Design: Today, customers enjoy a wide variety of trendy table design options. Comfort: A concrete picnic table offers a secure platform for meal preparation and dining. No one will worry a rickety table might blow over during a gust of wind or collapse unexpectedly during a meal. The concrete benches accommodate people of every size. 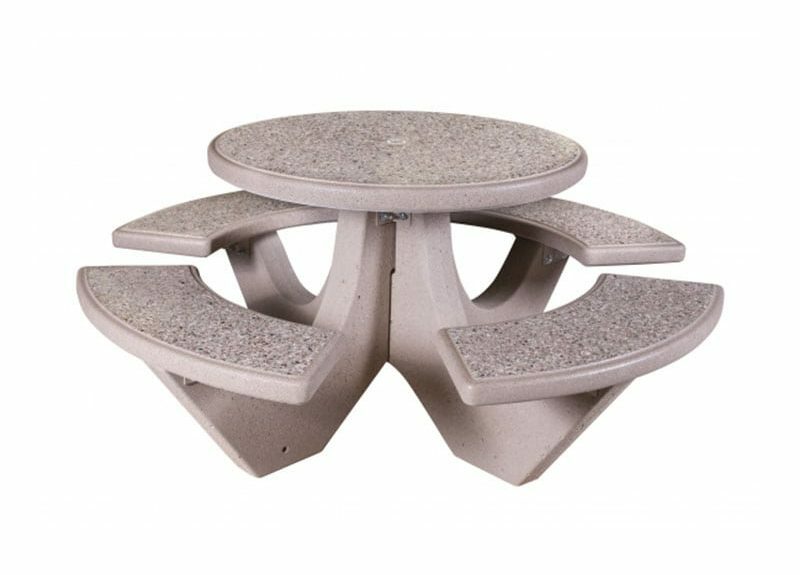 Sustainability: Unlike some plastic picnic tables, concrete supplies a completely sustainable rock-like product. Contractors can remove this material safely to a designated landfill if an owner ever decides to replace a concrete table. Wear Resistance: A concrete picnic table endures for decades. Owners may choose to provide some maintenance by applying sealants to the surface; however, the table will last for many years even without this occasional measure. The surface of the table withstands scratches, scuffs, and abrasions much better than most competing materials. Cost-Effectiveness: Unlike a wooden, metal, or plastic picnic table, a concrete table readily becomes a permanent part of the surrounding landscape. Its durability and weight renders it very difficult for thieves to vandalize or remove. (Some municipal and state parks choose concrete picnic tables preferentially for this reason.) This type of durable table supplies years of service, making it an ideal, cost-effective, selection for long term use. A stylish, high quality concrete picnic table provides exceptional value. It offers a genuinely sustainable solution. Customers seeking exceedingly durable, cost-efficient products should seriously consider adding this improvement to a patio, a back yard, a pool side, or a vacation retreat! If you are considering furnishing your outdoor site with a concrete table or bench, give us a call today and our experienced team members will be happy to assist you in navigating through our wide selection to find the perfect table or bench for your particular space. We are confident that we have the best concrete site furnishings in the industry AND we offer a best price guarantee so you can always be sure your getting the best prices on all your concrete furnishing needs. Park Warehouse sells high-quality commercial site furnishings for all types of indoor and outdoor facilities like parks, office buildings, schools, and playgrounds Customers can purchase benches, bike racks, picnic tables, trash receptacles, bleachers, lockers, grills, dog park equipment, structures, message centers, umbrellas, traffic equipment, and more. This entry was posted in Custom Site Amenities, Municipal Amenities, Park Amenities, Site Amenities. Bookmark the permalink.